The Permit is best recognized for its highly reflective, silver sides. The body is high and laterally compressed, giving them an oblong profile as adults (round in younger stages). Their back can be blue or green and their belly is bright yellow. Fins are gray or black. The Permit feeds mainly on bottom-dwelling crabs, shrimp, small clams, and small fish. 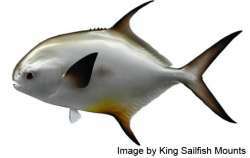 Permit are found throughout tropical waters especially in the Gulf of Mexico and the coasts of Florida. Permit can be found offshore on wrecks and debris and inshore on grass flats, sand flats, and in channels. They are most abundant in south Florida, with smaller specimens from every coastal county. Permit commonly reach 2 to 3 feet and up to 25 pounds. However, they can grow to 45 inches long and weigh 50 pounds.